MakerBot Replicator+ was awarded as the best 3D printer for schools 2017 by All3DP magazine. That’s because no other 3D printing manufacturer has invested so heavily in building a dedicated ecosystem for the education space. 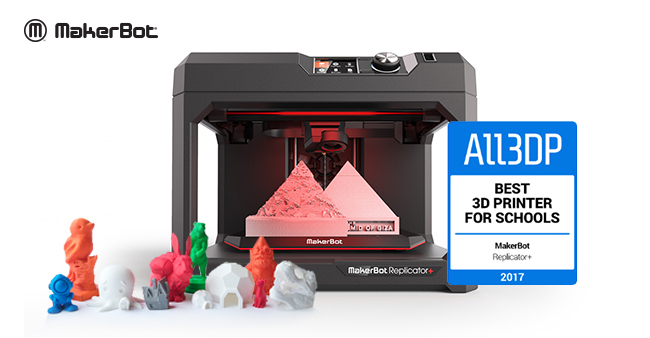 The MakerBot Replicator+ has specific safety features optimised for the classroom. There’s a removable flexible bed that isn’t heated; an extruder where the hot-end is out of reach of curious fingers; and a semi-enclosed build-space that protects the build area from foreign objects. Moreover, there’s a cloud-based slicing option, where a model can be selected on Thingiverse and sent directly to the Replicator via a dedicated smartphone app. Everything can be monitored on your smartphone. But the icing on the cake are the tools around it, and MakerBot’s legacy of offering the industry’s most complete 3D printing solution for educators was recently reinforced with the announcement of the new cloud-based platform My MakerBot and the new MakerBot Educators Guidebook. This guidebook is an industry leader in providing educators with step-by-step lesson plans to help them create impactful lessons for students of all ages which will meet all STEM requirements. MakerBot offers a full solution of 3D print for the education environment with dedicated education space on Thingiverse, STEM projects to make learning fun, plus an educator’s handbook to help teachers with core concepts around 3D modelling and printing. 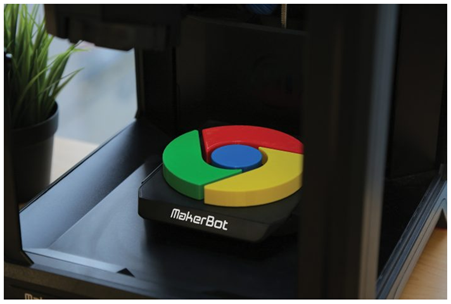 For MakerBot 3D printers aren’t the center of classrooms, students are.